The engraved Mason Drinking Jar has a rustic, western look to it. Expect tiny bubbles and wrinkles as it adds to the rustic look. The personalized Drinking Jar Beer Mug is a mostly square glass with rounded curves/corners and features a beveled round mouth piece. 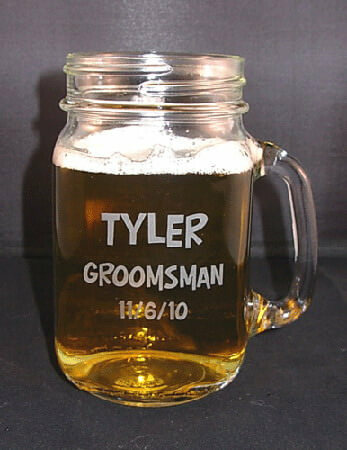 With the appearance of a canning jar, the personalized Mason Jar is a popular choice. You can also use this mug for small candles and kids love it for soda, water or juice. The Drinking Jar is 5.25 inches tall and holds 16 ounces. Personalization, text and/or design, on the front of the Drinking Jar is free, other options are available for an additional fee. We suggest keeping your text to 3 lines of 20 characters per line, it is okay to go over, it may just be smaller to fit it on the glass.